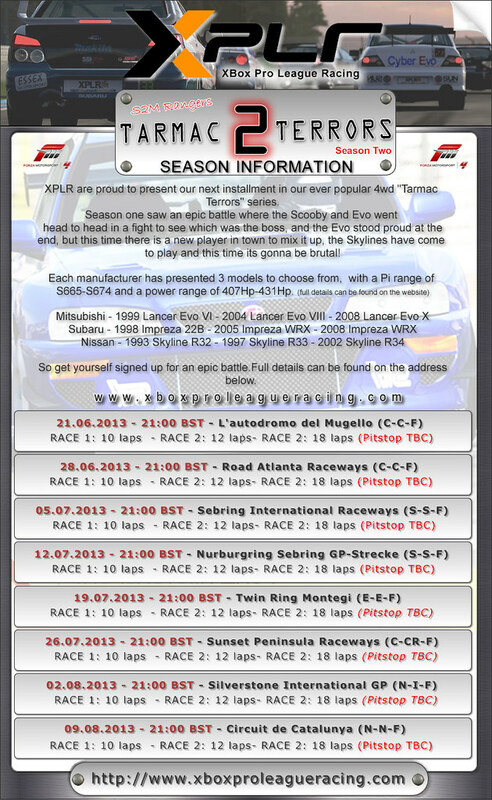 Im going to race in this series on the XPLR forum. And i wonder if there is anyone that want to team up with me? This will be hold on fridays 8pm i think! The 'Terrors' is the place to get your AWD fix, Expect sub 3 second 0-60 times and plenty of turbo'd goodness. Season 1 saw Mitsubishi and Subaru go head to head pitting the Impreza against the EVO VIII. After a hard fought season Mitsubishi claimed victory. Season 2 will once again be an all Japanese affair, Mitsubishi and Subaru will be joined by Nissan in a fight for Japanese AWD dominance. The cars are spec'd to a Pi range of S665-S674 and a power range of 407Hp-431Hp. The cars are in the final stages of testing and final details are being worked out. More details will be announced in the next few day and will be posted in the XPLR news section. I'll be making a brand new category for XPLR mate, as I have done with the TORA stuff? so not to worry it will be read. Thanks for starting this thread. We will be putting the builds up shortly on the XPLR site and as such I will post the info here as well. We will be doing a shakedown night or two before which all will be welcome too. Season one of these was blindly good, and with Nissan joining the battle it can only be better this time. No probs Gregbie, I made XPLR their own Category when i opened the site but forgot to move this thread into there to allow people to find everthing easier. Im at work till 9 tonight so LONG day haha, 13 hours total. Anyways how is one of my 2 favourite Scots? This sure does look fun. Something I won't be very good at but why not?! May have to give it a go! full build details will be going up on the site this weekend. As soon as I get em I will also post em over here. I cant wait to get my hands on these cars!! Nightmare has just posted up the builds for our next Friday night series, due to kick off in 2-3 weeks time. Season one was a belter and it would be ace if some of you can join us for some tarmac terror fun and games!! Sorry for the delay, Here are the builds. We will be doing a few shakedown nights before it kicks off and if anyone needs the build sent over let me know. Cheers Greg, will post these up as stickies mate, you have a calender or anything sorted yet? Any further info you get just inbox me and ill post it up as it comes. Looking forward to getting a hack on the track with you soon!! Sign ups for these are now open guys! May be running the Series depending on when I can get home from work mate, if I do will be in the R34, is the only one of the cars I actually like haha. Race Number I believe is 169 but may change it to my official number which is 332. Car Choice I will take a look shortly and let you know.